Game nights are always a sweet time! Plus it’s low cost and an easy way to hang out with friends and family. But sometimes you get stuck in the groove of playing the same old games. Or maybe your family is like mine and deciding what game to play leads to a 10 minute discussion about how dad chose the game last time. So if you’re looking for something new, here’s a new UNO card game for you to try… it’s called Spicy UNO! The Spicy UNO card game is founded on the traditional UNO card game — but with a few extra rules. If you’re unsure how to play regular UNO, it will help to familiarize yourself with how to play UNO — so you will know what each card means. (For example: Wild cards, Skip cards, and Reverse cards). Slap On 6 — If a player lays down a “6” card, everyone must slap the deck. 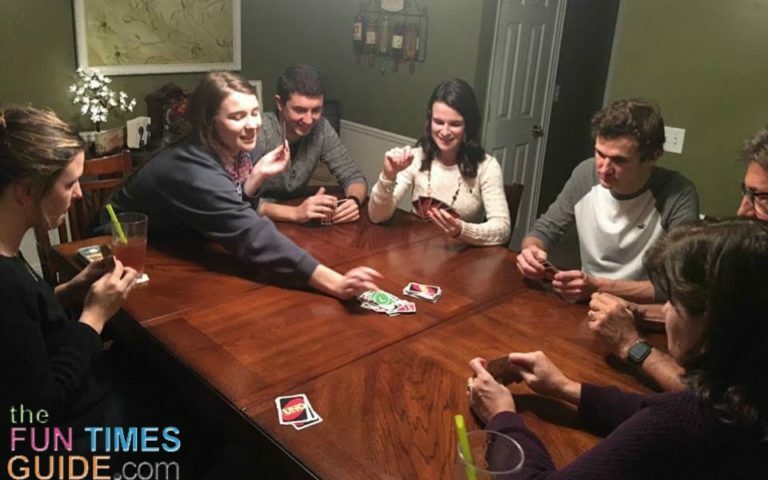 The last player to place their hand on top of everyone else must draw 2 cards. NOTE: A modification to the slapping rule is sometimes necessary. If this is the case, you can slap the floor or the table that you’re playing on instead of the deck — just be careful, because it’s not always obvious who slaps last. Silent 7’s — When a “7” card is played, there cannot be any talking until another “7” is played. If a player is caught talking, then he/she must draw 2 cards. 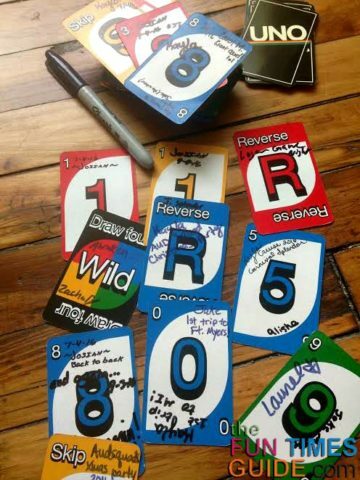 NOTE: The Silent 7’s rule gets tricky when someone has UNO or when a Wild card is played! Here’s why: Just like traditional UNO, whenever a player has one card remaining they must announce it. Therefore, calling UNO on a Silent 7 is a gamble. (If you don’t call it first, then you’ll have to draw 2. But if another player calls it before you, then they will have to draw 2 cards as well for speaking on a silent 7.) Keep in mind, hand gestures are allowed! TIP: I would recommend avoiding the Silent 7 rule until everyone gets the feel of the game. Usually by the 2nd or 3rd round, Silent 7’s can be introduced. Playing Out Of Turn — Any player may play when it’s not his/her turn only if it is the same EXACT card (same color and number). When a card is played out of turn, the order of the game is not changed — meaning one or several players may be skipped over when a card is played out of turn. The game resumes at the person to the right or to the left of the player who just played out of turn — depending on the direction of play (clockwise or counter-clockwise). NOTE: This rule gets especially tricky when Reverse cards are played out of turn — but that’s why it’s called Spicy. TIP: Make sure you’re quick when playing your cards to avoid being skipped! Stacking — Any time a +2 card or a +4 card is played, it has the potential to be stacked! So if someone lays down a +2, the person to the right/left will be expected to draw 2 cards. But if that player also has a +2 they may play it. Now whoever is next will have to draw 4 cards! TIP: Stacking is the only time you might not want to be so quick — because if another player chooses to play out of turn on a stack, you might just avoid the wrath of having to pick up 16 cards. Trading On 0’s — If a player lays down a “0,” then he/she has the option to switch hands with another player. 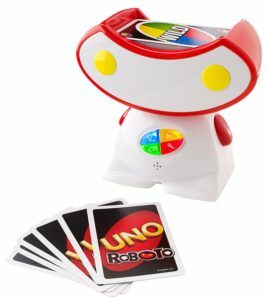 NOTE: If in the process of trading you obtain UNO, you must announce it — otherwise another player may call it before you. Asking For Help — If a player is unable to play when it’s their turn, he/she may Ask For Help. When this happens, all other players can choose to extend a card face down to the player in need. The player in need has no way of knowing if this help will actually be useful or hurtful to their game — because the other opponents may choose to lie about the “help” they’re offering. If they help card they received didn’t help, then the player in need may continue to Ask For Help or choose to draw from the deck. NOTE: If a player chooses not to Ask For Help, then he/she must draw from the deck until a playable card is retrieved — as when playing regular UNO. Signing The Winning Card — Whoever wins the game signs the card he/she won with. NOTE: Over time, your deck will be filled with lots of names, dates, and memories of your Spicy UNO card games played over the years. TIP: Feel free to put the date or the event name — if the occasion calls for it. Don’t you think Spicy UNO would be a great addition to your next game night? !